We choose different running shoes for terrain, weather, price, ability, etc. In the second of this 2 part series we are talking with Derek Wun, running shoe expert in California as we continue our search into the best running shoes of 2019. Derek will add to what started with Ross Martinson, from Philadelphia Runner Stores last week with his California based choices of the best running shoes of the year. When it comes to shoes, Derek has made a career out of all the aspects of running that make for good footwear. As an engineer, running shoe buyer, and avid runner himself, he looks at shoes from more perspectives than most of us could ever imagine. This benefits all of us when we purchase our perfect running shoe. 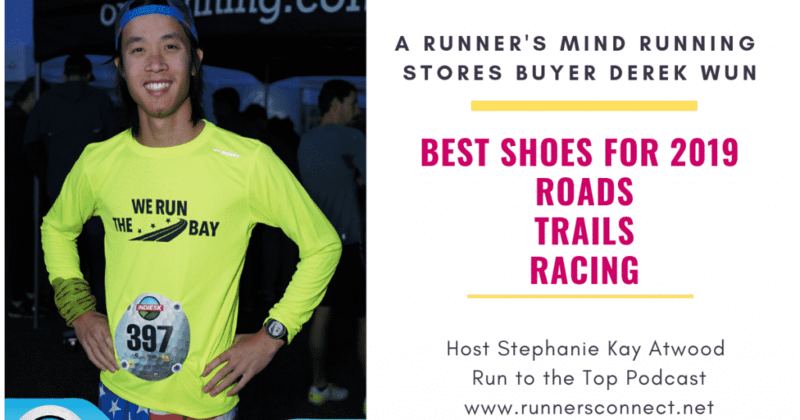 Derek Wun is the footwear buyer for A Runner’s Mind in the San Francisco Bay Area and has been in the industry for many years now having held most of the different running store roles from store associate to manager to buyer. While not having started with the normal cross country and track backgrounds like a lot of others in the industry, he has been a lifelong athlete, dabbling in many other sports before deciding that running was the one for him. From road training shoes to trail running, from road racing to ultra trail racing, and a couple of Derek’s personal favorites we’ll see how shoes vary from coast to coast and from one expert to another. Derek has a wealth of knowledge and will share with our listeners. Derek was brought into the running scene through the medium of obstacle course racing which has pushed him to compete in and chase longer and longer endurance events. He brings a unique background of sneaker and streetwear culture as well as one in science having studied Mechanical Engineering at UCLA and previously working in the biotech world, resulting in a cultural and analytical approach to the rapidly changing industry of footwear. Where do you live now? What is your favorite race distance or type of race? 5:20 How did you transition from engineering to running? 6:24 How have you been able to use your engineering background in the running industry? 7:36 How and when did you get into obstacle racing? 8:21 Did you race on a team or on your own? 9:00 What shoes are best for obstacle racing? 10:17 What is A Runner’s Mind and how did you get connected to them? 11:02 When did you become the shoe buyer for them? 11:54 What are the hot brands for 2019 and what innovations are you seeing? 12:58 What are your favorite road trainers? 15:43 What are your favorite trail / combo shoes? 18:58 Have you been able to try most of these shoes? 19:55 How many stores do you have and what’s the benefit of being an independent store? 20:57 What about road and trail racing flats? 25:35 What are some of your personal favorites that you use? 27:48 Do any elite or high-level athletes use any of these shoes? 30:34 What else can you tell us about shoes in general in 2019? 31:54 What shoes do you think we’ll see in Boston next month? 32:09 Anything you’d like to share with us? What is your favorite local training run or outing (location, starting point, parking, distance, terrain and safety issues)? Favorite shoe related book(s) or resource? Words of Wisdom or Humor? Who or what would you like to have featured on the Run To The Top podcast? We really hope you’ve enjoyed this episode of Run to the Top. The best way you can show your support of the show is to share this podcast with your family and friends and share it on your Facebook, Twitter, or any other social media channel you use. If more people who know about the podcast and download the episodes, it means I can reach out to and get through to the top running influencers, to bring them on and share their advice, which hopefully makes the show even more enjoyable for you! Thank you to our sponsors for supporting Run to the Top. Adding new comments is only available for RunnersConnect Insider members. Always providing information for runners, presented by runners and really appreciated by this runner. Give it a listen. Thoroughly enjoyed your podcasts with Dr. Brianne Showman Brown and Dr. Cameron Dennis. The are a great source of information! I always look forward to new Run to the Top podcasts! I just wanted to say I love listening to your interview with Jane Beedle. I was laughing in the car and I appreciate you giving us an update on her London Marathon. I also enjoyed listening to Jill from not your average runner. She was funny and engaging. Thank you for these wonderful interviews. I really love listening to this podcast since you have taken over. I found this podcast to be very interesting and helpful! I'm a new listener but the episode with Dr. Brianne Showman Brown was fantastic! Both the host and the guest were very knowledgeable and friendly and I was engaged throughout the whole episode! Great work! Run to the Top and RunnersConnect are incredible resources and offer amazing coaching and tips. Unfortunately, the new host Stephanie Atwood is less than desirable. She interjects her own opinions and stories so frequently into the interviews she cuts off her guest and she comes off rather rude and dismissive. Sometimes her tone suggests she’s bored and would rather interject her own thoughts and stories. I would rather hear more from the podcasts guests! This is definitely my favorite running podcast. The most part of the content is extremely useful and practical. The speakers are also very engaging and entertaining to listen to. Tina asks great questions, which are often the ones I think about as well while listening to the podcast. Also like how Tina summarizes the podcast at the end with the points discussed that can be further researched or implemented by the runner. Very informative with high quality production. I started listening to the podcast in November after Runnersworld changed the format of their podcast. I like variety of topics on Run to the Top podcast. I'm hooked! Love all your podcasts but really enjoyed the latest with Jeremy! I appreciate his type A personality when doing the audio cleanup and making it so comfortable to listen to! Seldom find running podcasts that are helpful for all ages and phases. The challenges of running at age 70 are certainly different than challenges I had in my 30’s! That’s why I have found this podcast so helpful. I have always gained new insights and enjoy the diversity of the guests! Great job! I listen to this podcast whilst running and absolutely love it. As a very amateur runner I’ve picked up loads of great advice and motivation from it, and also found some other great people to follow from listening to their interviews! Thank you! Sinead has a great, calm and down home way of interviewing the top people in the running business. If you want to learn about running I'd highly recommend listening each week. I have been listening to Run to the Top for a few month now. Loved the recent episode about mental blocks. I always look forward to new episodes, especially when they are about nutrition for runners. Keep up the good work! I've been enjoying this podcast for the past 2 years. Sinead has done a great job since taking over the show. Informative podcast for runners of all levels. I love the approach this podcast takes to tackling the issues and concerns of runners. Excellent guests on the show! Really like this podcast. The host is not the one who does most of the takling wich is good. The guests on the show is experts on their field and very inspiring to talk to. I get inspired,motivated and in a good mood every time I listen to one of the episodes. Highly recommended! I so appreciate the variety of guests RC has on the podcasts (coaches, researchers, ultra runners, women, men, elite, not so elite, doctors, etc). I also really appreciate all of the work of Runner’s Connect. I have been helped very much in my fitness through Jeff Gaudette and staff. This is still my favorite running podcast. Since Tina left the podcast has changed but it is still great. Sinead is very focused and well prepared. The Interview with Cherie G. was amazing. Inspiring. Keep up the good work! Thank you Tina for being so transparent with your speakers and podcasts about how we as a society need to change the way we speak and view our bodies as machines. I am also an advocate about healthy eating and healthy body image. To many people, especially female runners struggle with healthy eating and body image. Thank you for being vocal about this issue and bringing on guests who are willing to discuss this topic openly as well. I love all of your podcasts and enjoy listening to them especially when I am sidelined to do cardio machines! Thank you! I wish there were more running podcasts! My only critique is that I could do without the self-help/philosophy type episodes. I'd rather just hear more running tips I can actually act on. I'm currently binge listening to Tina's podcast and can't get enough. I love how easy the conversation is and the questions she asks in the interviews. I'm learning a ton, getting inspired and being entertained. Thanks! Excellent podcast. This is where I go for a deep dive into important coaching topics. Also love the inspirational life stories. Run to the top is from some dedicated runners and coaches. It provides great advice for training, motivation and racing. Tina is a great host and does some interviews with some of the most influencial people in the running / fitness / nutrition community. A must! This is by far the best running podcast I have found. Each week the topics are relevant and timely (except the one about running while pregnant, which doesn’t apply to me). The audio quality, while sketchy in the early episodes, is getting better all the time. The guests are terrific and intriguing, Tina’s questions are spot on. Topics discussed varied are very helpful to my running, each week I’m learning something new. I've been listening to the Run to the Top podcast religilously for a few years now. Its a great resource for anyone who is a runner. The host - Tina Muir - takes listeners through a variety of in-depth interviews. Some weeks are more insiprational stories that help keep you motivated or bring the running community together more tightly. Some weeks are interviews with technical experts that bring in-depth knowledge of topic related to running and fitness. Some weeks are interviews with an elite (or sometimes non-elite but still awesome) athlete with a story to tell. As a host, Tina's style is very open, but still knowledgable. She is very relatable and warm. Easy to listen to. I look forward to every week's podcast release to listen to during my mid-week runs. Thanks for giving me hours of entertaining and enlightening information to listen to! I am so glad I have discovered this podcast! Tina does a great job interviewing and providing helpful information as well as entertaining anecdotes. I also appreciate the organization of the Podcasts description area. This is very helpful and the links are great. Keep up the great work! Today I learned the importance of strength training to my running. I usually skip the cross training days in my training plan and use it as an additional rest day. No more, I will be working weight training into my activities. Love love love these podcasts!!! Very informative, great topics, full of fun information and personality!!!! I look forward to hearing them and share them with my friends. Definitely a must listen to!!! This podcast is awesome (underscore, underscore). Tina Muir is an excellent interviewer! Such great information in each episode. Great interviews with runners, coaches and running scientists. Tina Muir interviews all sorts of runners from recreational runners to Olympians. Listen to Tina on most of my runs. She has spoiled me for all other podcasts. Top notch. I haven't found a better podcast specifically for runners. I’ve enjoyed listening to running podcasts for information and inspiration. This podcasts does both. I started running a couple of years ago at age 45. At the time, I could barely run 2 miles without my knees experiencing sharp pain. For most of my life I thought that I was genetically … ummm … unfortunate in the running department. In the last couple of years, I learned a little bit about gait, cadence and foot strike (in part from podcasts like this one), and resolved to focus on running technique rather than my “natural” style. I’m happy to say that I’ve completed my 2nd half-marathon at 2:04 and am revving up for a full marathon in April 2017. We’ll see how that process goes, but I expect to be listening to this podcast the whole way through. A really interesting and informative podcast. A great range of guests and subjects covered by an engaging and enthusiatic host. Tina clearly knows her stuff and her passion for running is infectious. I love this podcast. I am an avid runner but only took it up in my late 20's. As such I didn't have the benefits of high school or college coaching or advice. Run to the Top fills in this knowledge gap and has helped me be a better runner. The host, Tina Muir, does a wonderful job of mixing informative & inspirational guests. Certain guests offer technical advice while others make you want to lace up and go for a run. I've been enjoying this podcast for the past 8 months. I continue to take something new away each week from the diverse list of guests on the show. Great job Tina! This podcast certainly provokes thought into thinking differently about your running injuries and improving your performance. It's well worth listening to and spending some time reflecting on your running goals as you enter a new year. I've been a big fan of Tina's and her RunnersConnect podcast for a couple of years now. She nails the questions and issues about which runners always ask. Love her positive and curious approach. Thank you, Tina, for bringing such a variety of wonderful and well-informed experts onto your show. Couldn't get through these hot, humid slogs (aka "long runs") without your podcasts! Tina has interesting guests who open up to her. She researches her guests and shows up prepared. Never disappointing and always thoughtful! What a legend Tina Muir is! A good human being sharing her knowledge of running and interviewing very interesting guests. Tina consistently has interesting and diverse guests. She asks thoughtful questions and you can tell that she puts work into preparing for each guest. Great running advice and inspiration, keep up the great work! Have replaced my running music! These podcasts are wonderful! All I listen to anymore when running. Very solid and helpful info. Thanks you guys! Inspirerende podcats voor hardlopers, met interviews met ver uiteenlopende personnen uit de hardloopwereld (renners, diëtisten, fysiotherapeuten, psychologen, etc.). Richt zich meer op de lange afstandsloper (HM en langer) dan op de casual jogger. I recently stumbled across this podcast and quickly binge listened to most of the last year. Tina has such a great variety of guests and information to offer from nutrition to running psychology to injury and recovery. I have been a runner for over 5 years but have managed to learn something new with each podcast. And it is clear Tina is getting more comfortable as the host/interviewer. Keep up the great work and great content! Interesting guests. I like also hearing about the hosts running and training. This is the first review that I have done for a podcast. Tina Muir is fantastic; she is an elite Runner who is modest and interviews top people, and asks pertinent questions. This is the best Running podcast. I highly recommend every Runner to subscribe to the Runners Connect Run to the Top podcast. So informative. Love to listen!! I have been enjoying the podcast on the last year, when I started listening to it while searching for more information about running. Since I'm a new runner, all the new information is great, and the podcast has been helping me a lot from tips, to information and inspirational talks. I like the fact the interviews change the subject from week to week, mixing nutrition experts, runners, trainers, and other professionals of the area. It's also pretty nice that the host, Tina Muir has a good sense of humor, which makes the interviews more fluid most of time. Thanks for the episodes and keep up with the good work. I have recently started listening to this podcast, and it's changed my running! Tina is a great host, and she responds to you if you e-mail her about a question. The guests are always relevant, and usually answer questions I've been thinking about but didn’t know where to go to find the answers. Now I know the answers are here. I always look forward to the next episode, and can't wait to listen to see who'll be on next. Thanks Tina and the Runners Connect group. Wish there was a podcast every day! This is a great podcast. Very informative and insightful. Great to listen to on a run or when relaxing. Tina is great!!! The variety of guests and topics is simply outstanding. I find it very interesting to hear different perspectives from various experts, from scientists to elite runners. My favorite episodes are those that let us in on the personal stories and journeys of the interviewee. Keeping it real, honest and human - Tina excels at that! Her kindness, respect for others and relatabilty are refreshing. I have recently started listening to this podcast on a daily basis both during my runs as well as my free time/commutes, etc. So far I have been EXCEPTIONALLY pleased with the information provided by guests and I think Tina does an awesome job at touching on topics that interest runners of all levels. As a Physical Therapist as well as endurance runner - I can say that the information provided by her guests have been sound and evidence based. I have been able to use this podcast as a refreshing, new way of continuing to learn and grow both professionally and personally. I recommend this podcast to all my colleagues and running buds! Thanks for all the effort you put into this podcast Tina - it does not go unnoticed or unappreciated! This is a great resource for runners of all abilities. There is a variey of subjects and guests that keeps you coming back. Great job Tina! Fantastic resource for runners of all abilities! Well done Tina! Awesome podcast with great content and guests! Love the content of this well put together podcast, passes the time well, is easy to listen to and great content. I love listening to this podcast while running. Tina is very passionate and enthusiastic about running and it shows during her interviews. She brings in a wide variety of guest who bring different while interesting topics. I highly recommend giving "Run To The Top" a listen. Tina and the team at runners connect have access to some of the top names in distance running. The interviews are full of useful and interesting information. I am so glad I found this podcast over a year ago. I love the professionalism of each interview. For example, I love that no inappropriate language is used. I feel like each podcast is there to benefit the listener and not a inside conversation between the interviewee and interviewer. Great topics! I love every single one of these interviews. The variety of guests is fantastic, and Tina asks the most insightful questions and really uncovers great information from the experts she talks to. I've learned so much in the short time I've been listening and will continue to follow this podcast in the future. Found the runners connect podcast earlier this year. I started looking for running podcasts to listen to at night before bed (thought it might help me wind down and sleep ). WRONG! Found my self staying up even later catching up on past episodes! Now I often listen during long runs. Tina is wonderful host and brings her own adorable style to the show. The guests are always relevant and informative. Highly recommend checking it out! Keep up the good work Tina! Tina has really grown into a fantastic, honest, real host for this podcast. I love the questions she asks, and there are some really great guests! Thanks! This was the first podcast I listened to....just getting familiar with this option with RunnersConnect. It was a great interview, and had lots of great information. But that was just the beginning...I emailed Tina afterwards for some sample workouts....she got back to me immediately, and we also exchanged additional emails with helpful information. Will use this much more often! Thanks Tina! Just love this podcast and I think Tina does such a great job interviewing! I love the variety of guests and love listening while I run. This is the first podcast I listen to when there are updates. The Runners Connect episodes always cover interesting topics. They focus on the science behind the claims when the guest is doctor or scientist, so I don't think these are just marketing ploys. The host also includes interviews with runners who have inspiring stories; sometimes elite runners, sometimes more "regular" people who've done cool things. In any case, it's a fun listen, especially during an easy run. This podcast has quickly become on of my favorite and go to running podcasts. I truly look forward to a new episode each week. I think what sets this podcast apart from others is the level of the guests, the wealth of knowledge and the overall variety of each episode. When I think of the episodes that I've listened to in just the past few weeks alone there was an episode on strength training, a great interview with Ellie Greenwood, an expert on metabolic disorders, an interview with Meb's coach, and so on. I also absolutely adore Tina Muir. She is incredibly sweet, sincere and genuine. I love the questions she asks - always trying to get to the "why" behind something. I thoroughly enjoy listening to Tina Muir's "Run to the Top" weekly podcasts. I'm like a little kid on Christmas morning waiting for her to post them. Tina is one of the top interviewee's in Running podcasts today! She brings her heart and soul into every episode that brings out the best interviews from her guests. Among my favorites was Meb Keflezghi's Coach Bob Larsen who provided listeners incredible insight into Meb's background and training and how they work together. Another favorite was Thomas Bobby Phillips, the legendary barefoot runner from India who ran the 2015 Boston Marathon barefoot. Bobby is arguably the #1 ambassador for running in India and has an incredible story that is a must listen to podcast. Tina has outstanding guests like these two every week. I strongly recommend Tina's "Run to the Top" weekly podcasts!!! I've been listening since mid- 2015. Tina is an adorable interviewer, and what she shares of her professional career is a fascinating peek into that life. The range of guests, from bloggers to writers to record breakers, holds my interest every week. I learn something about running, nutrition, fitness every episode. I've been telling my friends to tune in, and have bought products or books as gifts as well. This is my favourite podcast, and as a runner I find every episode informative and entertaining. It offers listeners valuable insights from authorities in distance running. The show has featured some well known athletes, scientists, physiotherapists and coaches. What I enjoy is that they all come across as approachable and willing to share their expertise. Keep up the good work! A great mix of education and entertainment. Highly recommended for runners of any level of ability or interest. I really enjoy the variety of interviews from athletes, coaches, trainers and practitioners. Great job done by the host Tina. Tina is great getting a very diverse group of co-hosts spanning all topics with running. Enjoy the podcast, every guest has had perspectives that were worth considering. Found Tina's self criticism a little irritating when she first started but her confidence has improved and she now comes across better. Hope that the recent introduction of advertising rewards her personally for the effort she has to make to produce the podcast. As a coach, I'm constantly sharing this podcast - the information given is trustworthy from industry leaders. I look forward to getting the podcast every Wednesday. Tina does a great job, providing varied, well researched content and an array of interesting presenters who come at running from lots of angles. She really does her homework before each interview, too. Not full of fluff like some other running podcasts. Her show notes are useful, too. A fantastic running podcast which I look forward to each week. Great guests and very interesting questions from the host Tina. I have learnt so much by listening. Thanks and please keep them coming! Tina does an amazing job interviewing. I like how she comments on her own experience and keeps it real. The topics are always interesting and inspiring. I have learned a lot. Thank you runners connect and especially Tina for one of the best, if not the best podcast for runners. 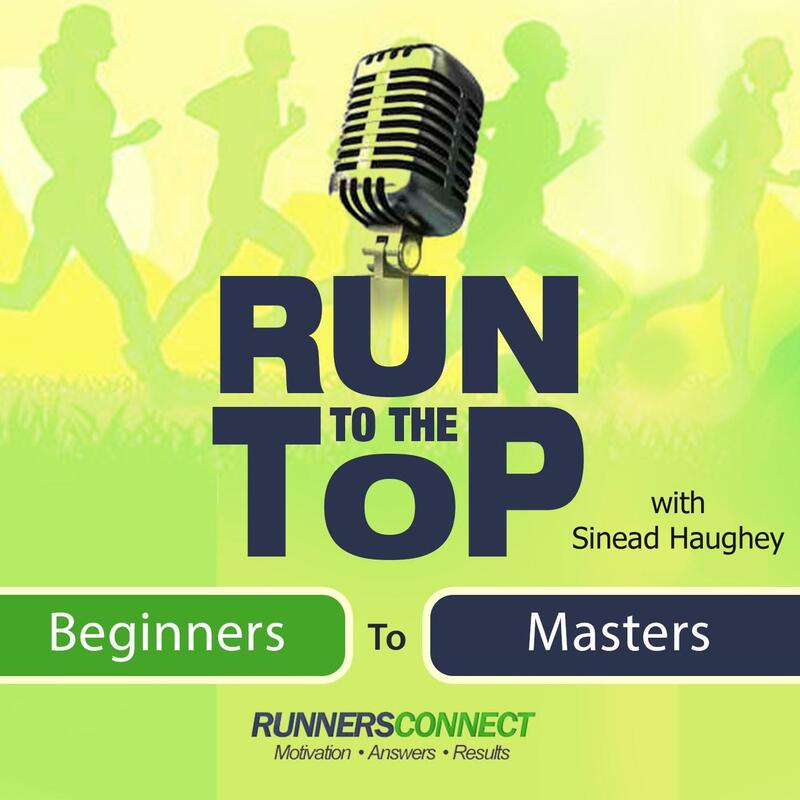 The RunnersConnect Run to the Top podcast has become my new training partner for easy runs. I love the wide range of guests that are interviewed, from elite athletes, coaches, health care providers, scientists and bloggers. Not only is it nice to have “company” on my easy runs, but I have really learned a lot about running as a sport and industry. The in depth interviews really allow you a peek into the minds of some of the leaders in the sport of running. If you were put off by the quality of earlier episodes, give this podcast another try. Tina Muir interviews a wide variety of guests. These include scientific experts, elite athletes, 'everyday' runners and coaches. Tina's interview style is friendly and she explains any technical stuff to make the content suitable for novices as well as experts. Early episodes had dodgy sound quality and Tina accepted even outrageous comments without challenge (other than a doubtful 'That's interesting").Now the sound has improved and Tina now challenges controversial statements. Always enjoy the guests on this show. Very high quality relevant content. I also love Tina, although she can ramble on a bit at times. Every runner needs to listen to this. Overall, a great podcast with a variety of guests that cover a wide array of practical running information. My very tiny concern is that I wish it was a little more polished with the introduction and sponsor commercials. Been listening for about a couple of months only, and i have become a huge fan. Interesting guests and a host who is honest and passionate about her subject. A treat for all runners of various levels. Congratulations on the 100th episode Tina Muir! I just started listening to Podcasts a couple of months ago and this was the first one I downloaded. I enjoyed the episode I listened to so much that I subscribed. Now I'm hooked. I've listened to all of the past episodes and I look forward to new ones. As an amateur runner for the past 7 years, I find the information given on the podcast to be very helpful. Tina is a great host and asks good questions. The guests are diverse and are a mix of fun, fascinating, informative, challenging, and practical. I trust that I'm getting reliable information and tips when I listen to this podcast. Subscribe and listen, you won't be disappointed! Keep up the good work, Runnersconnect! I love the guests that come on RunnersConnect. I always feel so excited about running when I’m listening—so it’s great during long runs, or short ones on those days when it’s tough to get out of the house! Have just discovered this podcast and have enjoyed it very much. So much that I am starting to work backwards through its history. Tina, you are doing a great job! What a joy it is to listen to Tina! She has a relaxed interview style and engages easily with her guests which in turn has the guests relaxed and open. Great variety of interesting and inspiring guests and topics. As someone who is new to running I love that Tina explains things in lay mans terms without being condescending. Thoroughly recommend! Tina Muir's interview with Julie Benson was so powerful. I listened to it on my easy run workout and could visualize what she was going through at Boston. Tina does a great job week after week getting speakers. Thanks Tina and RunnersConnect. I truly enjoy this podcast & listen to it when running & working out. It is positive and fun but, most of all, the information is so helpful. Tina is a wonderful host of the show. One of the best running podcasts out there. Tina Muir is a fantastic host - she's knowledgeable about the sport, engaged with the guest, and prepared to ask them the questions we listeners want to know. I like the variety of guests and topics - from physical training to mental training to injuries to elites - each week there's something that grabs my attention. Thanks RunnersConnect for the great podcast! I absolutely love this podcast as well as Tina as a host (anyone else love how she says “podcast?”) It hits on such prevalent issues in the running community and I can relate everything even the episodes I don’t expect. I learn something new every time and hope it never stops! My favorite topics have to do with weight and balance especially hearing both sides of weight loss vs. taking care of your body and amenorrhea. Tina Muir does an excellent job of bringing in experts that give great running/fitness/health advice, no matter what level of runner you are, and also brings in some of the most interesting figures in running today and in the recent past to tell their stories. Tina is an elite runner and shares her personal highs and lows, giving the average runner some great insight into what it takes to compete at an elite level. I’ve been listening to these podcast now and what I enjoy is the useful information. I’m a 37 yr old runner trying to get faster and be competitive. Many of the podcasts include elite athletes with tips and experiences as well and respected professionals and Dr’s. A lot of useful information for beginners and experienced runners. I love this podcast. Very informative, and Tina gets the best guests. This is my favorite running podcast. It is always delivered in time weekly on Wednesday. I am intrigued by each guest discussion from science to elites to everyday folks. Great perspectives and I always learn something. Love that they are interviews but just as easily conversations. Tina is great and very down to earth. Best running podcast, hands down! This is by far the best running podcast I have ever listened to! This podcast is great for the long time runner as well as the beginner runner, because the topics they discuss are common problems for all runners. In a noisy world full of crazy diets and a lot of false information about being healthy, this is place where like-minded runners can tune in, learn how to work through their common pain points, and feel apart of a welcoming, fun, hard working community. Aside from Tina’s adorable British accent, she is so genuine and knowledgable about the sport, and truly has a heart to teach us how to be a better runner, often by learning from her mistakes. I so appreciate her authentic personality and reminder that running is a tough sport, even for the Elite. I look forward to listening to these podcasts on my long run days, as they have taught me so much and really help me pound out the miles. Thank you Tina and team for your work on this awesome podcast! This is by far the best running podcast I have ever listened to! This podcast is great for the long time runner as well as the beginner runner, because the topics they discuss are common problems for all runners. In a noisy world full of crazy diets and a lot of false information about being healthy, this is place where like-minded runners can tune in, learn how to work through their common pain points, and feel apart of a welcoming, fun, hard working community. Aside from Tina’s adorable British accent, she is so genuine and knowledgable about the sport, and truly has a heart to teach us how to be a better runner, often by learning from her mistakes. I so appreciate her authentic personality and reminder that running is a tough sport, even for the Elite. I look forward to listening to these podcasts on my long run days, as they have taught me so much and really help me pound out the miles. Thank you Tina and team for your work on this awesome podcast!! I also love hearing about your training. Your podcast motivates me more to cross train with my cycling. I don't really love running before but now i do thank you so much!!!! Runner's Connect is actually the first podcast I ever listened to. I downloaded the episode that interviewed Janae Jacobs, as I was a regularly reader of her Hungry Runner Girl blog. I listened to that episode and just kept on listening. I have since become an avid podcast listener and listen to a variety of podcasts on running and nutrition. I keep coming back to Runner's Connect on the regular, however, because it continues to offer such a good variety of guests and to cover a wide range of topics. I like the balanced approach the show takes to running. I listen to a lot of podcasts on veganism and ultra-running and, while I love those shows, I recognize that they can be kind of extreme. Host Tina Muir is a special treat. Even though she is an elite runner, I find that I can relate to her and feel inspired by her without feeling intimidated. She is incredibly knowledgeable and conducts great interviews which are light-hearted without being silly or "fluffy." I highly recommend the show to runners of any level who want a reliable resource on a wide variety of topics from running form, nutrition, training, cross-training, techniques. etc. Thank you, Tina & Runner's Connect! your podcasts... Tina you are such a wonderful inspiration, wealth of knowledge and a joy to listen to. I have learnt so much! I look forward to every new download. Tina does a great job as a host with a variety of guests and topics. She asks great questions and makes the podcast interesting. The guests are wonderful and include a variety of topics and different levels of running. It’s relatable to all runners. My favourite running podcast by miles! I am currently subscribed to 6 running podcasts and this is defo my favourite. Its a pleasure listening to Tina’s passion and honesty about running. She always finds great guests and drops knowledge on my head with each episode. She is an elite runner and approaches her podcast with the same drive and commitment. Thank you for doing this, hugely appreciated. I really enjoy listening to all of the great interviews Tina conducts durning my recovery runs. It can educational and fun at the same time. I started listening to Run to the Top from the beginning only about a month ago.. already I have gone through every podcast and can’t wait for the new ones to come out. Since Tina took the helm I have seen her grow so much as an interviewer. She truly researches the person she will be talking to and has very thoughtful questions. Some say she should listen more but I appreciate her wisdom as well, after all she is an elite runner (and she loves sweets, so she is a woman after my own heart) Keep up the good work! I listen to Tina's podcast every week. There is always something that inspires me and/or helps me achieve my running goals. The host is an elite and well spoken runner. She gets great guests that talk about their passion of running and their unique journey. It is so good. As someone who loves running, I look forward to new episodes of this podcast- a great variety of guests and good quality interviews. Always interesting and different. Like the mix of technical info and fun interviews. Thank you, Tina, for this wonderful podcast! Love the guests and love your passion for our sport! I have learned so much about running from this podcast. The guests are so interesting. Tina interviews her guests in such a warm and friendly way they relax and share their knowledge freely. She also has throughly read and researched her guests. Time and time again she will ask a question and her guest will be amazed at the depth of knowledge she has about them and their work. Tina I Really enjoy listening to the show. Thank you. I listen to these appropriately enough on my long runs on the weekends. The guests are usually pretty interesting and I tend to learn quite a bit and it keeps me motivated. highly credible guests provide helpful, science based information on running and related topics. I love this podcast! I never walk away from listening to one without having learned something that I can apply to my own running! I listen often while running, which I find to increase my motivation. Great podcast. I would like to see more "regular people" interviews. Maybe some people who are attempting their first marathon, someone who is trying to qualify for Boston, someone trying to break 3:00, or someone who typically wins their local races. I'd like to see what their training plans are like, how they juggle running with their work and family obligations, what they do to keep motivated, and any tips they have for other people in similar shoes... Thanks and keep up the good work. Listening to these podcasts has been powerful information for me to have an advocate for my own health and enable me to continue and get back into running. I can't tell you how many PTs out there do not know how to support running and don't know how to treat a runners injury. In addition to learning about running shoes and the right kinds of cross training, I finally feel like I'm on the right track to healing after 15 years of injury in part due to the incredible wealth of information on these podcasts! I'm a middle of the pack marathon runner and I love this podcast. I just discovered it and am downloading every available episode to keep me company on my solo runs. I so appreciate the variety of guests on this podcast. I also really appreciate all of the work of Runner's Connect. I have been helped much through RC. Thank you for all of the improvements that have been made to the podcast. I look forward to it each week. i LOVE the runnersConnect podcasts! their topics are super relevant, especially to injured runners and for folks who aspire to be better. Tina Muir does a great job of asking interesting, thought-provoking questions and keeping her interviewees engaged and excited about the interview. i leave the podcast smarter, and inspired. and her guests are exactly who i am interested to be learning from. keep it coming! I so appreciate the variety of guests RC has on the podcasts (coaches, researchers, ultra runners, women, men, elite, not so elite, doctors, etc). I also really appreciate all of the work of Runner’s Connect. I have been helped very much in my fitness through Jeff Gaudette and staff. Thank you for all of the improvements you have made to the podcast. I really look forward to it weekly. I like the fact that I know which day we will have a new one. I truly mean that these really encourage me. RC nails it with in-depth, sound interviews with all the top experts in the field. Don’t miss an episode, whether you’re new to the sport or a seasoned pro! Always interesting, with a wide variety of topics and guests. Interviews with runners and with experts on training related topics like psychology, stress, sleep, nutrition. Always learn something new! This is a great podcast. I've actually listened to every podcast, some multiple times. Tina Muir does an excellent job interviewing all of her guests - she seems to have a positive chemistry with every one of her guests, keeping the conversations & material interesting and relevant. I highly recommend this podcast to runners of all levels of experience. I look forward to her weekly updates. I'm listening to quite a few running podcasts and usually a host/s have some kind of agenda be it in the training or nutrition and it shows in the topics chosen for discussion. That doesn't seem to be a case with Tina Muir, and it's very nice. As the title suggests there is something to be learnt for all levels of ability in this insightful and informative podcast. The host is great, she seems like she is learning things at the same time as you are. This is definitely not just for elite runners! Great work from the runners connect crew. I so enjoy listening to this podcast and hearing Tina's interviews with various experts across the running community on a variety of topics. I've learned about everything from nutrition to running form to just staying motivated. I look forward to hearing this podcast each week and adding more knowledge to everything I have learned so far about how to run more efficiently and safely. Love Tina, her positive attitude, and all the great advice she brings to the listener! Informative with runners at every level & age in mind! I’ve been listening to the Run to the Top podcasts for a couple of years and it has become my “go to” source for information on all things running. As a Masters runner who’s still fairly new to the sport, I appreciate that there’s something for me in every episode. I like that the guests provide a good balance of information on a variety of topics of interest to all runners with some inspiration mixed in to encourage anyone, athletes & non-athletes alike. I love Tina’s genuine and personable interviewing style and appreciate her well thought out questions; she clearly does her homework prior to interviewing each guest. Thanks to Runners Connect for a quality broadcast! Run to the top is defiantly Top !!! Fantastic informative Podcasts packed with useful educational and humorous info for anyone who loves to run thanks Tina and the team keep them coming like the hills we run !!! This is a really great podcast. I think there is something interesting for new and experienced runners. The podcasts cover a wide range of subjects, from the more technical aspects of improving your running by looking at specific areas (running form, strength training, nutrition etc) to hearing stories and experiences from all kinds of elite athletes on how to deal with pressure, training under busy schedules, training as you get older and a whole host of other great subjects. If you are interested in running this is well worth a listen to. Tina is a very knowledgable interviewer. Every episode is interesting, different and holds my attention. And I can't even count the number of times the interviewee has said to Tina, "Wow, you really did your research!" It is so great to listen to somebody that has so much heart and passion. Was so happy to find this podcast! The range of topics covers all aspects of running and is very informative for all levels of runners. It is fantastic to hear from elites, coaches and top professionals and I love that it is hosted by an elite too! Tina Muir brings great questions and positivity to the interviews in a conversational style that makes me feel part of the team! I definitely recommend for anyone interested in broadening their running knowledge and lifestyle. I enjoy listening to these podcasts. Tina does a fret job selecting the guests who bring great topic discussions and good perspectives. Thanks for good information! I listen to a lot of podcasts on my work commute. This is , hands down, my favorite since Tina tool over. The interviews are great, the topics are always interesting and Tina is always upbeat and approachable. I'm not an elite by any stretch, but there is always something here for me (and any level). I always get excited for my Wednesday commute! I'm new to listening to podcasts regularly and Runner's Connect is my favorite for everything runners want to know about. Tina Muir's interview with Fernado Cabada was beyond inspirational. It's one of the best I've heard! It was heartfelt and uplifting. I'm excited each week to listen to a new podcast to further my running knowledge. Prior to Tina Muir, the podcasts were good but not great. Tina, being the thorough person she is, does fantastic background research before approaching the person to be on the podcast for the week. She then has a list of questions, but modifies it based upon the responses. Interviewing is tough and it is fun to hear Tina gaining confidence, making the podcast her own, and enjoying the podcast process! Keep up the great work. Tina Muir does an amazing job bringing in very knowledgeable hosts covering a variety of topics directly or indirectly related to running. All podcasts are great additions to the wealth of resources available for RunnersConnect members and general audience. Keep up the good work, Tina & team! I’ll keep listening & learning. I really enjoy listening to the podcast as I do my long runs. There is a varitey of topics. Tina has never talked down to us slower runs. I appreciate it. Tina Muir has really come into her own as an interviewer. There is a lot of humanity in this podcast, and it offers something for runners at all levels. I just listened to the podcast with Fernando Cabada and was completely blown away! Runners whine a lot, about injuries, about clothing and shoes and races and everything else. After listening to the incredible story of Cabada, from growing up poor with a father in and out of jail, to becoming a man with the mantra of “slow feet don’t eat,” you will never look at running and racing the same again. I will be rooting for him in Chicago this weekend! I’ve learned so much from listening to this podcast. The guests are leaders and experts in their field, so you know you’re getting up to the minute correct info. I’ve been running 30 years and I have learned more from this podcast in the last few weeks than I have in previous years. It’s so convenient to listen on a run and I know I absorb the information better by listening to the podcast than I would reading a book. This is a great podcast hosted by someone that I think is really enjoying and cares about what she is doing. The guests are very knwledgeable and it is nice to be getting a variety of topics from week to week. Highly recommended. This podcast is super beneficial and has great tips! It's wonderful to have a podcast that helps you feel apart of a running community. This podcast is perfect for any runner, beginner and elite runners. The next best thing to running! Discovered this podcast after an injury, been really impressed with the quality of the guests and the content. Keep up the good work. I like this podcast very much. Great in information, great interviews! Thanks for doing it! Listening to the podcasts has become a must-do in my week. I’ve learned so much by listening and have been made aware of great resources. Good job, Tina Muir! I've listened to many running podcasts, but this one has some of the best content out there. Driven by actual studies and research, this podcast shares the most recent findings on all things running. Tina Muir was a hesitant interviewer initially, but she improves weekly. I love her warm, real personality. Excellent! My training and goals have been improved by listening...really love it. I really like the variety of guests and the informal style of Tina Muir. I'm fairly new to running and I find valuable insights in almost every podcast. The "old" podcasts are great to go back and listen to as well - some great guests and its interesting to hear contrasting interview styles. I listen to these while running and they really helf the miles go by. The Run To The Top podcast is one of the best for runners and anyone with general sports and fitness aspirations. Tina is an elite level marathoner and so knows the questions to ask, and backs it up with a great panel of guests. There is something here for everyone! Love this. I love all aspects of running. Her guest have been on other podcast but her interviews cover areas that weren’t covered in those podcast. Always like the Sock Doc and thats how I found this podcast. Keep up the good work Tina…. This is a great podcast for all runners. The caliber of guests is fantastic. I appreciate the topic selections as well, it's not just the same information being recycled like you see in some popular running magazines. Thanks for consistently providing great interviews with interesting guests. I come away with wonderful information and excitement about running! Tina Muir is the great interviewer at Run To The Top. In her 7 months or so here she has turned this into a wonderful podcast. Top coaches, runners, authors everyone is getting interviewed here. From Dan Lieberman and Chris Macdougall to Alan Webb. Minimalist running, training, diet, cross training and all things running are covered. Tina gives a fantastic interview and is genuine. She is interested in the discussions and is also a fine runner. She brings a runners enthusiasm and interest to her work. I really love this podcast. It does such a great job of reflecting the passion and intelligence of the Runners Connect website, and always teaches me something new about the sport I love. The interviews really function like conversations between people, which makes it a really fun listen. It’s my go-to running companion during the week. Thanks so much! Keep up the good work! I love the Runner's Connect podcast for treadmill runs or strength training sessions. The topics and interviewees are always fascinating, informative, and motivational. Tina is an engaging and knowledgeable host who always gives a thorough presentation of the topic. These podcasts always bring a wealth of knowledge to the audience. Very informative, and not afraid to go in depth. Only criticism: that intro music! Love listening to these while running - gives me something to think about, absorb, action. Keep up the great work! I listen to a lot of podcasts about running and this one is quickly becoming my favorite. Tina Muir asks thoughtful questions not only for her benefit, but for the average runner. I'm learning quite a lot and will recommend this podcast to my running club. Every week I can rely on this podcast to learn something new and interesting about running. Tina Muir is doing a great job keeping the topics and guests diverse. Tons of good stuff in the back catalogue, too. Tina asks thoughtful, creative questions of the show's guests. I really enjoyed this recent podcast of Greg Lehman because I learned that he will be at the same marathon as I am in Sept, the Erie Marathon. I'll be cheering for Greg to get his BQ!!! I started listening to this podcast shortly after the new host, Tina Muir took over. While the first one I listened to (an interview with Boston Marathon Race Director Dave McGillivray) had poor sound quality, the interview itself was interesting and inspiring to listen to. This podcast quickly became one of my favorites to listen to for it’s range of topics, most recently I listened to the interview with Chicago Marathon Race Director Carey Pinkowski, and before that, one on women runners and fertility (try finding info on that anywhere else). Other episodes have authors of running, psychology, and sports related books - Matt Fitzgerald (80/20 Running), Chris McDougall (Born to Run), Travis Macy (The Ultra Mindset), and RW Columnist Alex Hutchinson to name a few. Tina is still getting a feel for being a comfortable podcaster I think, so sometimes she’s a little scripted, but I enjoy hearing a podcast interviewer from an (elite) runner rather than a coach sometimes (it seems like every other running related podcast is hosted by a coach). Listen to a few, and you’ll learn a lot. I came to RunnersConnect several years ago because their blogs were so rich with practical, thoughtful and research based information. These podcasts take things to an even higher level. I learn something every time I listen to one. Thanks RC! This is an excellent podcast and Tina is really coming into her own as an interviewer. Great information, great guests. Highly recommend. Great for a long run! I love listening to these podcasts for my long runs! It is highly entertaining and makes the hours go by quickly. Tina is adorable and does a great job at interviewing. I would suggest these to anyone, runners and non-runners alike! Great podcast with a range of topics relevant to all runners. Whether you're looking for specificity of training (see Everything You Need to Know About Electrolytes: Nina Anderson, for example) or the evolution of women's running (see What Can You Do to Change the World?- Kathrine Switzer for example) this podcast covers it. Great interview style with intelligent questions. I look forward to each new episode! Tina Muir's interview with Kathrine Switzer on Runners Connect about her inspiring story and the women's running movement is one of the best interviews I've head in a long time. Kathrine's words spoke to me so deeply, and Tina is such a thoughtful and authentic host. I'd highly recommend this podcast and others on Runners Connect to anyone who loves running. Hosted by an elite marathoner, this cast speaks to ALL levels of running. Excellent content, great production, perfect for on the run listening. Looking forward to catching up on all the past episodes. Lots of great information. Interviews are detailed but never tedious. I feel like I've learned something from every episode! Great info and interviews, and a nice mix of technical and motivational topics. It's really interesting to hear host (and elite marathoner) Tina Muir's take on topics that affect recreational runners. Very helpful advice for runners, but also some topics that are helpful for everyone - like the nutrition topics. I have really enjoyed learning so much from each of the podcasts I’ve listed too so far. I subscribe to a few podcasts for runners and Run To The Top is #1 for me. The guests are varied as are the subjects. The information can’t be beat. Tina Muir has really done a great job as the host for the show and her true thirst for knowledge in running and life show through as she interviews those on the show. Great job Tina! This is the best running podcast. The hosts hold great interviews which are very entertaining and interesting to listen to. I look forward to every new podcast and always learn something new. The Interviewee are are great! Information is Great! Interviewing is a hard job. The Interviewer needs to pose shorter questions and listen to the answers. Don’t be in such a hurry to tell what you know; we want to hear from the interviewee. Let them talk and listen and react, BRIEFLY. You do not have to restate everything that was said. You are dong a pretty good job. Keep growing. Jeff and his team provide great insights into all things running, and how our bodies work and adapt. I like that it is science and researched based. The podcasts all make me think, and I love listening to them on a run. I have followed Tina’s blog for several months now, so I knew any podcast with her in it would be fantastic. Hearing that both Tina and Doug Kurtis’ first marathons were…interesting (she can’t even remember hers, and Doug had to take a pit stop to get his feet taped!) really took off the pressure that I was putting on myself for my first marathon. I listened to them chat for the last half of my long run, and I can honestly say the miles flew by! This will definitely be a staple in my running routine from now on. Just started listening to this podcasts. It’s quite al right as a running companion, but it could use a little upbeat. I’m new to this pod cast but have really enjoyed the last few downloads. Great interviews with inspiring and well informed runners. Alex is a wealth of information, thank you. But I felt that the question stated in the title was never really answered... aside from the mention of steroids. I was hoping for a clearer picture of supplements that work and those that are "illegal, but he never really got there". Notwithstanding, I enjoyed the interview! These podcasts are the perfect companion for long runs. Great take-aways for running and life! I listen to my podcast while running and while working. To be able to do this you have to have a very unique presentation that lets you know when the important stuff is being talk about, be generally entertaining throughout the podcast, and not lack inflection so you don’t ignore the whole podcast. I have podcast packed with information, but they are so boring you get to the end of it and you realize you listened to none of it. Then I have podcast that are so packed with information that you can’t possible multitask through the show. There really not a way to describe exactly what I mean, but there are very few podcast that are perfect to listen to while running and working—but this is one. Just started listening to this podcast & heard elite runner Tina Muir talking about full-body gait analysis - so fascinating! I will definitely be checking out the whole series. I have been listening to this podcast for the past year and enjoy it. As a beginner runner (less than 2 years running) I have learned a great deal. The most recent interview with Alex Hutchinson had some very helpful information on supplements. Tina Muir, the newest interviewer, is getting more comfortable each time out. Highly recommended. A great podcast to listen to while running! There aren’t many podcasts on running that are worth listening to. There are a great number of topics, for all your different interests. I discovered Run to the Top a few weeks ago, and it’s quickly become my #1 podcast for when I spend more than a few minutes in the car. Tina does a great job with her guests - they share some fascinating insights. Interesting topics with a focus on the science behind the claims. So great - I learn so much with every podcast! Highly recommend!!! Tina is so great to listen to! I look forward to new episodes! I eagerly await Wednesdays for the new episodes of this podcast! They are cover a variety of running related topics that are both informative and enjoyable for runners of all levels. I also like the grassroots feel of this podcast. My two recommendations for improvement would be the audio quality, which is not always the best, and having the newest episodes available on iTunes sooner. I often see on Facebook that there is a new episode and follow the link to iTunes only to be disappointed by the fact that the episode is not yet available. Overall a great thing to have available to listen to on my runs! These are great podcasts to listen to while I do my longer runs. Good information and not only for elite runners. Thanks for reviewing this with subject matter experts. It's already helped. Great resource with some really good interviews and insights for runners. Highly recommended for gym and jogging! Interviews are well thought-out and guest are top notch. New host podcaster engages with the guest very well and is able to pull out the best information from the guest. Highly recommend for all runners! This podcast has been revamped with a new female host that is also in the elite range of the sport. The guests are very high quality and the content is engaging! Regardless of your distance, fitness etc if you love running there's some great info here. Found the nutrition episode particularly useful recently. This show just gets better. Great interviews, advice and direction for all standards of running (interviewer improving). So pleased I found RunnersConnect, now have loads of back issues to listen to. I've always enjoyed the RunnersConnect podcast, but I love it even more since Tina Muir took over as host. The weekly shows are relevant to runners of all abilities, and every week I hear something that helps me become a better runner. RunnersConnect is by far my favorite podcast! Tina Muir has great guests, demonstrates a professional attitude and her candour in regards to her interviewing skills, which are continously improving, is charming. I'm a huge fan of all things RunnersConnect, so it's no surprise that I also love their Podcasts. They bring in knowledgeable and reputable people in the sport, so if you're into running, this is the Podcast for you. I was enjoying this podcast. Is there a plan to make more new episodes? If you’re reading this, congratulations: you found the real deal. Mix one tablespoon of insight, with equal portions of discipline and confidence, add further seasoning to taste, patiently sauté until race day, being careful not to burn, then amaze yourself with the result. Will’s interview technique gets better and better with every podcast! The latest from April 9, 2014 with Magness is fantastic information and the questions are well framed to elicit fantastic conversation. I look forward to even more! My boyfriend who is a cross country coach and turned me on to this podcast. Its amazing. I find the information very useful and I can listen to this at work, home or even running! Keep them coming! These podcasts are really interesting and insightfulI and I enjoy listening to them. I also highly recommend visiting the blog on runners connect, which have a lot of good articles on all things running. I really enjoy this podcast. Jeff has great guests, and it's been cool to hear him become more and more comfortable as an interviewer as the months go by. Lots of good -- sometimes conflicting -- perspectives, so always lots to think about. Definitely one of my favorites. Podcast is one of my favorites on running. Great guests and great questions. In a sea of "couch to 5K" podcasts, Runner's Connect stands out as one of the very few programs for serious distance and middle distance runners. Interviews with experts (e.g. Tim Noakes) and with elite (past, present and future) athletes a coaches who have something valuable to discuss make this podcast my favorite. Jeff Gaudette does a great job leading the interviews and is clearly respected by the other athletes, coaches and experts who answer his questions seriously - no fluff. Great job Jeff. Full of great information! Great for new or experienced runners! Jeff does a great job brimming scientists and other subject matter experts to the table and discussing a wide range of topics I find extraordinarily relevant. Not just to running but to all my fitness endeavors. His podcast have explored the wide world of running myths and brought clarity and focus. Keep it up Jeff. For mine "RunnersConnect" is the best online resource for runners currently available. Learning a lot and enjoying the process. Thanks! Jeff does a great service to us runners by covering great topics and going directly to the point. I also subscribe to his email newsletter on my personal email address: it is one email that I read immediately as soon as I see it, it has that level of consistent relevance, just like his podcasts. This is the ideal podcast for people who want to learn. I'm a beginner training for a marathon and I keep going back to past podcasts getting more information I missed or didn't apply to my routines. Sign up for the newsletter on the website. There is so much free information given i don't need to look for other articles anywhere else. There is only one podcast I don't like. It's not from the host but of the guest who doesn't have a radio voice and she talked about herself half the show. Other than that I look forward to the new ones every week even when Jeff is slacking over the holidays. Love the discussions, stories, questions that this podcast provides. Also love how in depth these elite runners get about their own training regimes. Great group of experienced and successful coaches. I wish I'd found them earlier. 4 of our best-selling ebooks, 5 in-depth video courses, 6 high impact training resources, and 4 race-specific training guides.